The long-serving co-founder of the Fiddlehead literary journal and publisher of Fiddlehead Poetry Books (later Goose Lane Editions), Fred Cogswell, died in New Westminster, B.C. on June 20, 2004 of a heart aneurysm at age 86. Like the poets Pauline Johnson and Al Purdy, and novelist Sinclair Ross, Cogswell was not a British Columbian at heart, but he had come west to live with his daughter in his old age. Cogswell mentored Candice James, a New Westminster poet laureate who founded the Royal City Literary Arts Society which, in turn, generated the annual Fred Cogswell Award For Excellence In Poetry in 2014. Born on November 8, 1917, in East Centreville, N.B., Cogswell was one of the pioneers of Canadian literature in Atlantic Canada. He edited the Fiddlehead from 1952 to 1966, subsidizing the operation with his own funds. He also wrote more than 30 books of poetry, most recently The Kindness of Stars (Borealis Press, 2004). 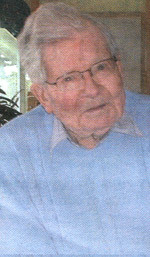 Cogswell studied at the University of New Brunswick, earned a Ph.D from the University of Edinburgh and taught English at the University of New Brunswick in Fredericton from 1952 to 1983. He also edited one of the first anthologies of translated writing from Quebec, The Poetry of Modern Quebec, in 1976. Although the simple packaging of the Fiddlehead review sometimes led to condescending opinions of the enterprise, and of Cogswell by association, his counterpart on the western edge of Canada, George Woodcock, who served for many years as the editor of Canadian Literature at UBC in Vancouver, was a staunch admirer of Cogswell and his work. He wrote, "Many of his poems are portraits, others are laconic comments on existence. There is the occasional myth and a good deal of reflection of the imprisoning effects of conventional thought." Cogswell received the Order of Canada and the Alden Nowlan Award for Excellence. He was a life member of the League of Canadian Poets, the Writers Federation of New Brunswick and the Association of Canadian Publishers. Among his better known poetry titles was Light Bird of Life: Selected Poems, published in 1974. "I was fortunate to have known him," said SFU Special Collections director Eric Swanick, who visited Cogswell in May of 2004, "He was a prodigious scholar,a great supporter of literature, especially poetry, and a great, gentle man. My last conversations with Fred were over dinner with his daughter and his biographer. When I arrived that evening Fred had been translating from French into English his friend's poetry. That friend was Hermenegilde Chiasson,the Lieutenant-Governor of New Brunswick. Our conversation roamed over many topics that evening. As I was about to leave our talk turned to baseball. I hadn't realized that Fred was such a very avid baseball fan, a loyal supporter of the Expos." The first poetry book printed by Fiddlehead Poetry Books was Fred Cogswell's own The Stunted Strong, a sonnnet sequence, in 1954. He became publisher of Fiddlehead Poetry Books in 1958. He published more than 300 volumes prior to his retirement in 1981. He was replaced as publisher by Peter Thomas in 1982 who changed the imprint's name to Goose Lane Editions and began to also publish fiction. In 2005 Goose Lane issued a second edition of Cogwell's first book, The Stunted Strong, to honour him and to mark the golden anniversary of the press. [Alan Twigg / BCBW 2016] "Poetry"